KATIE: It's HEE Haw, Waffles. 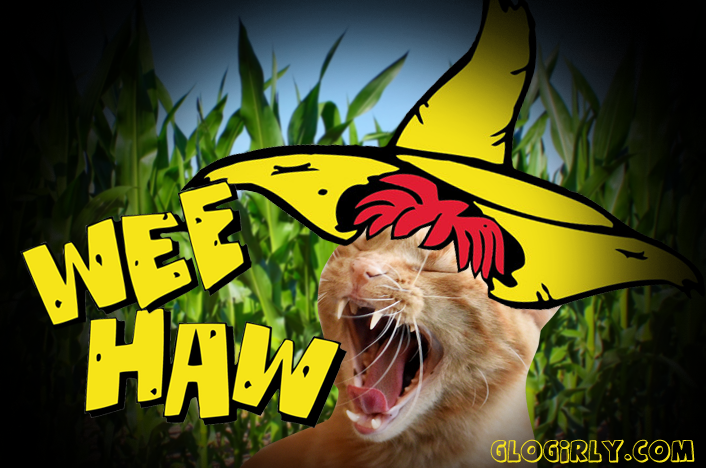 Not WEE Haw. WAFFLES: Yeah but don't you want to sing it with me? Because then it should be WEE Haw. WAFFLES: Boss! I can't stop signing The Green, Green Grass of Home. KATIE: That sounds like the Tom Jones Syndrome. WAFFLES: Oh my COD... is that common? HALO (right): Well, It's Not Unusual. Where, where is my chicken? For a bucket of drumsticks. Glogirly's mom and dad LOVED Hee Haw. Not a Saturday night passed without that twangy country music and silly slapstick jokes blaring from the big console television in the living room. Her parents were huge country music fans... Buck Owens, Roy Clark, Glen Campbell. If her mom and dad were alive today, they'd probably say they just don't make country music like they used to. 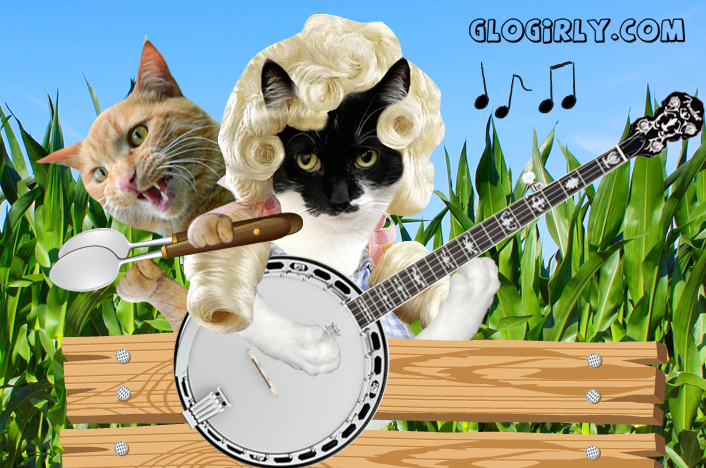 With the big trip to Nashville just days away, Hee Haw has been on Glogirly's mind lately. Her parents would be absolutely tickled that she's going to finally see Nashville. And now that they are gone, that twangy Hee Haw theme song brings a big smile to her face. Sweet Halo has had a hard knock life. If you meet her, she’ll tell you all about it! First there was life with a hoarder. Then there was a very bad flea infestation (don’t worry, her coat is coming back beautifully). Three year old Halo’s luck turned from bad to good when she was brought to PAWS. We sure hope her lucky streak continues and she’ll have a short wait for a forever home. Halo is available for adoption at PAWS, Pet Animal Welfare Society in Norwalk, Connecticut. 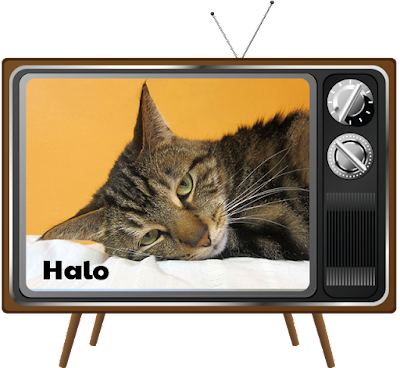 Every Saturday we feature adoptable cats from PAWS Pet Animal Welfare Society in our TV Trip blog series. Through the magic of Photoshop, the shelter cats join Katie and Waffles for some time-travel adventures while we spoof our favorite classic television shows. We'll also introduce you to the 'Cameo Cats' and share a little bit about them. Maybe, just maybe... our crazy antics will help find them a true forever home. OMC does this post make me smile. I love Hee Haw reruns...such a fun show. I am a huge country music fan. And my parents say all the time that they don't make country the way they used to. And I would have to agree with them. Someday I am determined to get to Nashville too. They regret that they never did. I'm so glad Halo is safe after such a traumatic life! I hope a home finds her soon! I have never seen Hee Haw, but you made me and my mum laugh a lot. I hope Halo soon gets her home. What a purrfect tv trip before Nashville! We think you might have a hit show on your paws, Waffles. Wee-Haw sounds like fun! My dad remembers Hee Haw. So long ago. 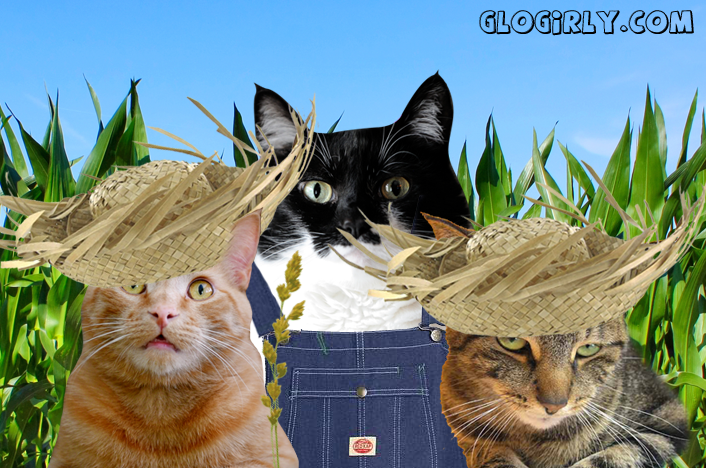 Our mommy loved watching Hee Haw with her parents too ... Wee Haw .... MOL! We hope Halo finds her furever home very soon! My Dad used to watch Hee Haw too and the bucket of drumsticks sounds pretty yummy! I hope Halo gets her forever home soon. I used to watch Hee Haw with my grandfather, it was a good show. Thank you for visiting us on our 1st Blogoversary and for being our friend. I wish I was going to Nashville so I could meet you- hopefully I will get to Blogpaws next year. That wasn't a show the woman or her folks watched, but she's been having a flash back to the Ghost and Mrs. Muir lately thanks to finding out it's also a BOOK! Clapping wildly over TV program That was great Katie and Waffles. Encore, Encore, Encore! You nailed Hee Haw. When TW was in Nashville in the ‘80s, she did go to the Hee Haw store. In fact she bought a tee with the logo and might still have the bag. There’s a pic on her FB page. Great job doing Hee Haw guys..Hee Haw was just for fun and to bring a smile to your face..You are a pretty tabby girl Halo..I'm sorry to hear you've gone through some bad times..I hope someone out there will love you furever..
Halo reminds me of my Suki, and that always makes me smile. Hee Haw brings back memories of a much simpler time growing up. HeeHaw is still on in reruns now! You know as corny as it was the comedy has held up! I too remember this show, while it wasn't a staple in our house, we all watched it enough for me to have memories of it. Mum says amembers that show too. Silly jokes and all. Nononononono …..It would be SHE Haw. Halo is a sweetie. Purring hard for her to find a wonderful loving forever home.